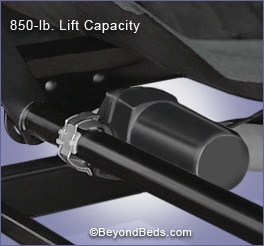 Our New S-Cape 2.0 furniture style adjustable bed is more than an adjustable bed base, it’s an upholstered piece of furniture. The entire bed base is covered in contemporary gray upholstery fabric and comes complete with decorative wooden legs. Advanced wireless remote control stands up on Its own, so it can be placed on your nightstand for easy access. While other adjustable bed bases lift you and move you away from the wall and away from your nightstand, our Wallhugger® engineered adjustable bases lift you while simultaneously sliding you back to the wall, keeping you in line with your nightstand. Transform your bedroom into more than just a place to sleep. Raise the head to read or watch TV then press the flat button to quickly return to the flat position. The S-Cape comes with built in under-bed lighting that can be used as a night light to illuminate the floor under and around the entire perimeter of the bed or use it to create ambience in your bedroom. Wooden legs - height from floor 16"
No sync cable needed for simultaneous action or paring split sizes. One or two remotes will control two bases. Exclusives: CSA-certified to both UL- and CSA-applicable electric motor standards. Free-Fall Design Safety Feature. 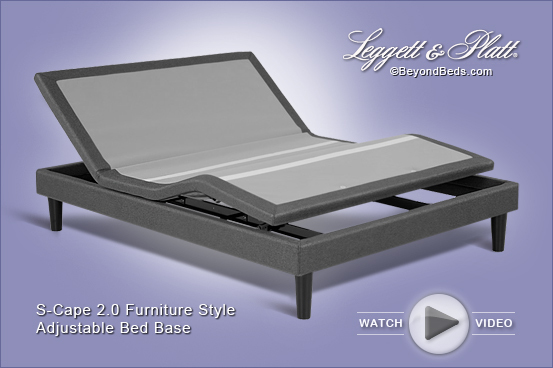 Leggett & Platt® Adjustable Beds Group (ABG) has been a premier provider of adjustable bed bases for over 40 years.